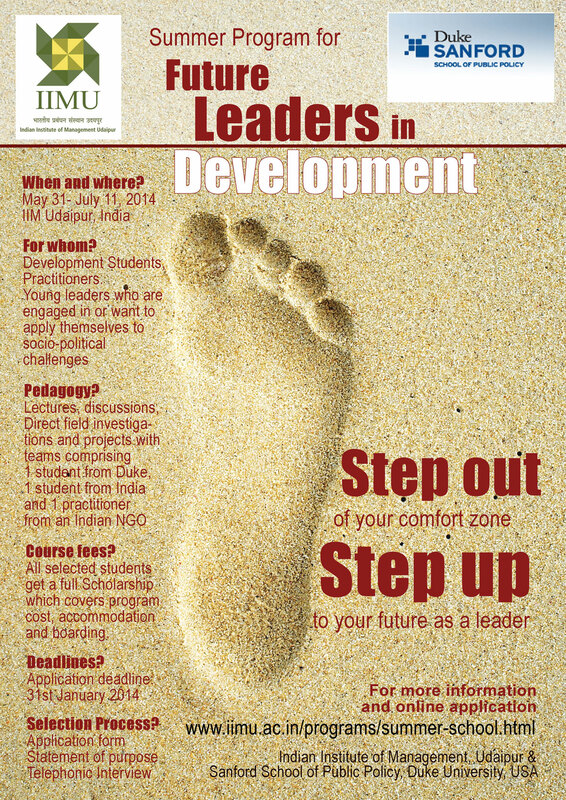 IIM Udaipur and the Sanford School of Public Policy at Duke University are pleased to invite applications for the 2014 edition of the Summer School Programme for Future Leaders in Development. This programme is a six-week signature academic workshop sponsored by the Center for Development Management, Indian Institute of Management, Udaipur and the Sanford School of Public Policy, Duke University, USA. It brings together a selected gathering of students and practitioners of development drawn from Duke University, prestigious Indian universities, non-profit organizations and social enterprises. Aimed at students and NGO professionals seeking careers in the academic field and practice areas of development and related sectors, the summer school programme imparts a plethora of theoretical perspectives, research skills and empirical tools. To encourage peer-learning and project development, students will be placed in a three-person team that will include one student each from an Indian University, an early career staff member from a non-governmental organization (NGO) and Duke University. Teams will spend considerable time in rural areas as hosts of an NGO in order to identify and assess existing gaps in community needs. Through this experience, they will employ academic learning from the classroom for transforming real-life. The program is fully residential. Students will stay in IIMU dorms while classes are in session. Host NGOs will arrange home stays during field visits. Selected participants will receive a full scholarship to attend the program and cover program costs, although they will have to arrange for their own travel to and fro from Udaipur.